Sorry about being a little late with this movie review. We’ve been working even during the holidays and just watched MMFF’s best picture for 2013. We were supposed to watch Boy Golden first but we got curious when we found out that 10,000 hours won as the best picture and yet, it didn’t become the top grosser. We are tired of watching Filipino movies that are not only out of the budget but are too shallow that you can already guess how it’s going to end just by watching the trailer! We love Filipino film makers who are brave enough to gamble on high quality films such as 10,000 hours! Did we say high quality? The cinematography is not like those of local films where your eyes will sore because such films wouldn’t even pass for a TVshow. Are the Amsterdam scenes really shot in Europe? Because the cars were left hand driven. Props to Director Joyce Bernal for dropping her old ways of bringing crappy movies in to the big screen. Carla Humphries was also a good pick as Isabelle. We couldn’t think of any Filipina actress who can portray the role well. Bela Padila is also a good choice. She reminds us of Bea Alonzo, only prettier and a better actress. 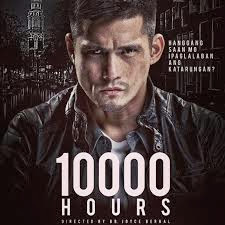 Although we grew up watching Robin Padilla films, we think that this is Padilla’s best performance ever! Why? Because there wasn’t a chance that we got distracted with his “bad boy antics”. Padilla’s wardrobe were really good – just the right wardrobe our well-dressed Senator would wear. There wasn’t too much action scenes that made the film more realistic. The Medina father and son are our favorites! Don’t you just love how natural they portray every role that is given to them? No wonder Pen Medina bagged the best supporting actor award. 10,000 hours is a film that should be watched by every Filipino. We guarantee that your money will not be put to waste. Anyway, One thing I hate about the holidays is the MMFF because they keep showing crappy films for as long as I can remember. But I'm seeing hope in our movie industry. I'm surprised to find out it's directed by Joyce Bernal! Thanks for sharing. By the way…OTJ is a cut above the rest! Didn't get the opportunity to watch this and my father in law who watched it said it was good. Great review mommy!